Looking for a muzzle that is lightweight and humane, yet allows your horse to eat freely? The Cribbing/Free to Eat Muzzle Limits unwanted behavior, such as cribbing and biting, not eating and drinking. Ultra-lightweight aluminum grill and nylon webbing is resistant to rust, rot and mildew. The Cribbing/Free to Eat Muzzle has a comfortable padded noseband with four-point attachments to prevent pivoting and rotating. Muzzles fit most halters. Cribbing/Free to Eat Muzzle is rated 3.7 out of 5 by 43. Rated 4 out of 5 by angmgross from Finally something that stops a cribber! After working my way through every other cribbing collar on the market I decided to give this a try and it WORKS! I have a 15 hand Arabian gelding. In order to use it most effectively, make sure the bars are vertical when you attach it is the horse's halter. When I first put the cribbing muzzle on the bars were horizontal and my horse was still able to crib. The straps that attach the muzzle to the halter aren't tough and broke within the first few weeks, but we easily secured them with duck tape. We also wrapped parts of the muzzle and the halter with fleece and vet wrap to make wearing the muzzle more comfortable for our horse. The best thing about this cribbing muzzle is that our horse can still eat his grain, grass and hay! Rated 4 out of 5 by Ellymay from So far, so good, my smart overweight mare still has it on after a week. Rated 4 out of 5 by Libby from Does the job, but horse still has pretty good rub Due to my skepticism about how well a horse would be able to eat with this flat design I first tried out the very bulky and heavy metal muzzle. Compared to that, this cribbing muzzle is amazing. Compared to a cribbing collar, well, it is just another device that I find I need to weigh out my pro's and con's with it. No it doesn't have to be put on super tight like the collar, but my horse did manage to get a big rub after a few weeks under chin/lower jaw. I am given to understand that this is because she is itchy and rubs her face pretty hard and in turn this muzzle rubs her in that spot. I suppose I cannot fault the muzzle design for that - but horses do itch. I need to figure out a way to pad that particular spot. On the plus side I found after that initial "learn how to eat again" period (that I believe all muzzles require) my horse could eat much more and much easier from this muzzle than the other. If you have an incessant cribber it's worth a go. My mare is a TB with sensitive skin so I do not believe the rub issue would be applicable to everyone. I do think it's more comfortable than her dare collar that she is wearing while that rub heals up. I am hoping once flies go away the rub issue will go away and she can go back to wearing this 24/7. Rated 5 out of 5 by midwestponymom from best option we have found we have had this for about 6 months for a very persistent cribber, and have been happy with it. We have tried some of the other styles: The muzzle with the single hole in the bottom frustrated our horse and he struggled to eat with it (he would have trouble at the round bale with that muzzle and he happily eats with this one). We have also tried the steel one (the red one with white fleece) and found that it was really heavy and eventually it rubbed a raw spot on our horse's nose :( We have found this one to be comfortable for the horse (no rubbing or sore spots and we continually watch it) and it seems really well made to put up with all of the abuse. A few things we have learned: make sure the bars are vertical, make sure to put the little plastic guides over the velcro fasteners - those really help hold those straps in place (we will use zip ties wrapped in comfort tape if one of those size ties breaks), and we use it on a break-away halter in case any mishaps occur. All in all - a good solution to a tough problem. Rated 1 out of 5 by Concorde from Wasn't enough for my persistent cribber... This product fits well and is light weight. Even so, my very persisitent cribber got around the aluminum bars and just cribbed through the nylon after wearing it for 5 minutes. Shortening the fit didn't help either. If your horse is persistent like mine, try the Dare cribbing collar or the steel cage muzzle. 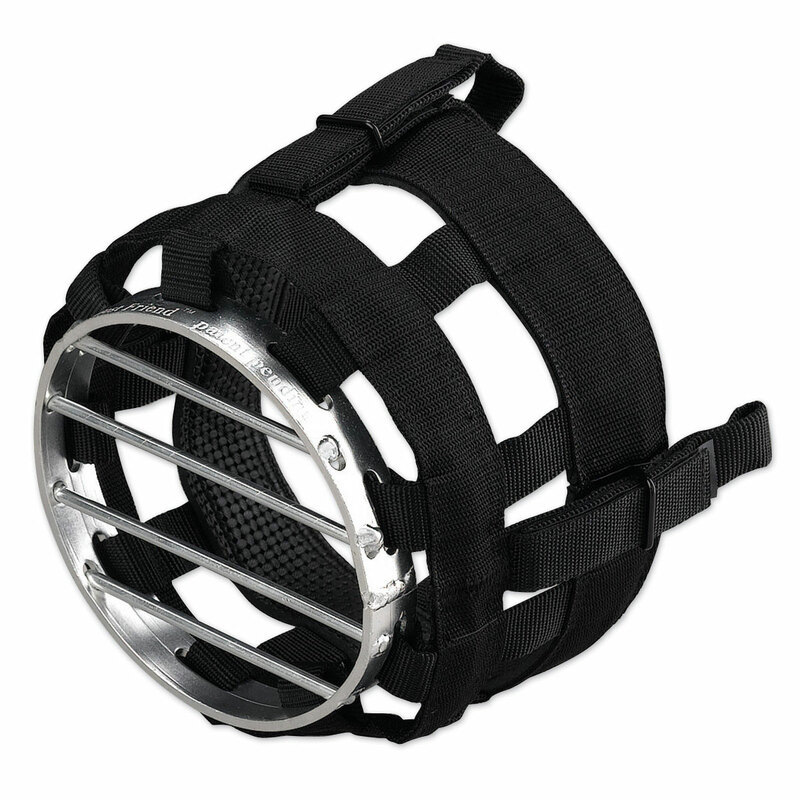 Steel cage muzzle is heavier, but much less restrictivefor eating and breathing. Rated 5 out of 5 by JCap from Light weight, strong velcro, solid design, no rubs Bought this about 3wks ago for my incessant cribber (we also have a miracle collar, cribox, a Dare collar, plenty of history of workups, supplements, special diets, full turnout, all the hay she wants, and work 4 days a week--none of which have stopped her). She's like a new (happier) horse after a couple weeks w/o cribbing. She doesn't mind wearing this, it hasn't rubbed her (She is a 15'3"Oldenburg, built like a tank, with a head to match; I ordered her the XL size), and fits well to a regular halter (I have a Perri's) and so far has stayed in place. She cannot crib in it (on her water bucket, on the fence, on the waterer, on the stall wall). We did learn to put the muzzle on with the bars parallel to the length of her face, b/c if they are transverse, she can still figure out how to get to the fence boards through it to try to crib. I did note one of the bars bent slightly, but I'm hoping she won't break anything for a long time. Will update if she does. She can drink water by pushing her face against the muzzle, turning it a slight bit to an angle, and getting down into our square shaped auto waterers enough to drink (IOW's, the whole muzzle doesn't fit inside the tank opening, but she can easily drink using her technique). I do worry about cold weather (we at at 15 deg right now) and eating and drinking through cold metal, but so far she doesn't look like that's an issue. If it seems to stop her or slow her down, I'll switch back to the less effective Dare collar for cold days. But for now, we are happy with this answer! Rated 1 out of 5 by wromine from Horse figured out how to crib I am deeply disheartened and extremely disappointed that this device didn't work. Within one week my horse figured out how to press the metal grill against a fencepost and crib on the inside edge of the metal surrounding the grill. My horse is 18 years old and has been cribbing since he was 3, so I have tried every device on the market. I hate seeing him so miserable, because the neck devices have to be so tight that he gets rub sores and he has to keep his head lowered all the time just to breathe easily. I was so hoping this would be a more humane device for my horse, but it didn't work, and I wish I could get my money back. Rated 5 out of 5 by Mike S from The Cribbing Free muzzle works My OTTB is a cribber. With this muzzle he could not crib and, after some equine learning, became quite proficient at eating and drinking. I would not leave my horse with aggressive horses or horses who might be attempting to move up on the pecking order. The cribbing was eliminated when out to pasture and in the stall. Recommend having two halters, one for the cribbing muzzle and one for supervised grazing. That said, it is easy to attach and remove. Had it 3 weeks...no issues with sturdiness.